Image from Ann Marie Fleming’s graphic novel The Magical Life of Long Tack Sam. Image courtesy of Ann Marie Fleming. There was once a man who could ‘take needles out of his mouth for half an hour at a time’, who could make ‘beautiful vases appear’ from thin air. He was a magician, and the people of a Northern Chinese village would watch spellbound as he ‘performed a hundred magic feats’. One day a little boy asked him if he could turn stones into bread as food was scarce. The magician told the boy that he would only conjure bread in front of his pupils, so the boy pleaded with the magician to teach him. The boy was taught the art of magic and went on to become a great magician, revered by the likes of Harry Houdini and Charlie Chaplin and performing in theatres around the world. 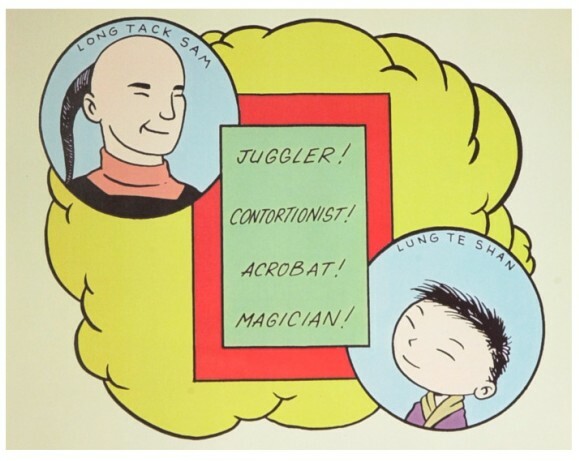 This forms one of the many myths surrounding one of the most successful magicians of the early 20th century – the world renowned Chinese acrobat and vaudeville performer, Long Tack Sam. Lurking in the storage rooms of the Australian National Maritime Museum, you’ll find a cabinet containing a black and white nitrate negative taken by another famous Sam. 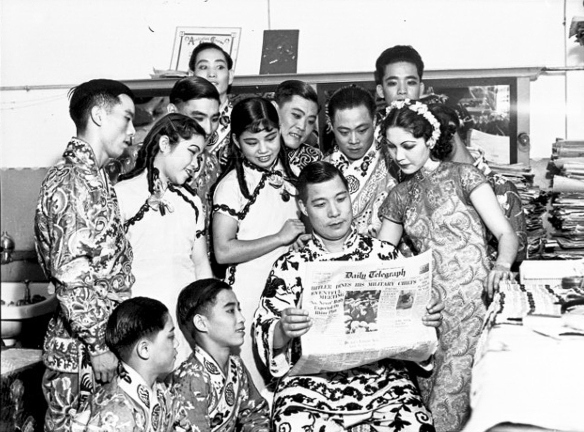 Samuel J Hood’s photograph depicts Long Tack Sam no longer a boy in 1880s China but a man in 1930s Sydney, posing with his company of artists reading The Telegraph newspaper. Chinese magician and acrobat Long Tack Sam with his company of artists 1936. Samuel J Hood Studio, ANMM Collection. As the popularity of Sam and his company of performers soared, myths about the magician proliferated. Some said the short, cigar-wielding magic man spoke many languages from French to German and even Yiddish. A true performer and a man Ann Marie refers to as ‘a citizen of the world’, Sam adapted as he toured doing comedy shows, impersonations and acrobatic feats of endurance. In the second ever show at Broadway’s famed Palace Theatre in New York City, he shared the bill with the Marx Brothers! He promoted his show by skydiving into Bondi Beach, dropping leaflets offering free tickets to that evening’s performance. Sam and his ‘wonder workers’ performed in countless theatrical spaces across Australia including Sydney’s State Theatre, Melbourne’s Tivoli Theatre, Adelaide’s Regent Theatre, Hobart’s Prince of Wales Theatre, Perth’s Ambassadors Theatre and Brisbane’s Wintergarden Theatre. 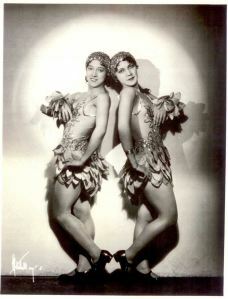 The ‘smiling entertainer’ and his company in 1931 included, among others, his two talented and beautiful daughters Nee-sa and Mi-na (Ann Marie’s grandmother), ‘Bertini, a vagabond violinist’ and Van Zulecam, “the mad Dutchman”’. One must not demand too many Western virtues of the Oriental. But Long Tack Sam is the exception to prove the rule…he makes his act a continuous fusillade of jokes and quips, sotto voice imitations, parodies, and grotesque foolery. He can pucker his face into the quizzical fussiness of a Londoner as he speaks in pure English of Piccadilly, and of a Yankee, when he sees a joke. He is irresistibly droll. The audience recognises him at once as a man with an Occidental sense of humour. Many Chinese artists can do amazing things…but they would not appeal to the British race unless dished up in a new way. It seems Sam was right about this as not all Chinese performers experienced the same positive response and the impact of the White Australia Policy was felt even in vaudeville. Ann Marie tells the story of one Chinese acrobat, Sun Tai, who was imprisoned when he arrived in Australia, despite the fact he had been invited to perform. 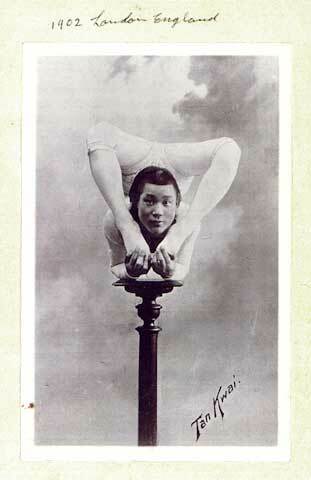 In 1936, the year Hood photographed the great magician, daughter Nee-sa and the rest of the troupe, he appeared at the Hoyts Regent Theatre in Adelaide. As a ‘distinct addition’ to motion picture, Sam blended his unique brand of entertainment with the very medium that was threatening his industry. Hoyts’ general manager at the time advised Adelaide’s News that it was, ‘by far the costliest stage attraction engaged for any picture show in Adelaide to date.’ The 35-minute act was one that had to ‘be seen to be believed’ and ‘left a packed audience gasping with amazement’ as Sam performed his famous bowl of water trick and Nee-sa played the violin while doing the splits. Can you imagine what going to the cinema today would be like if it was accompanied by a vaudeville stage act?! 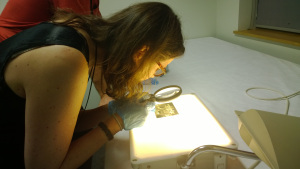 Ann Marie Fleming inspecting the museum’s Samuel J Hood photograph of her great-grandfather. The Long Tack Sam story is one that has had many paths and continues to evolve as new pieces come to light online. It is a story that has, rather surprisingly, reached all the way to the Australian National Maritime Museum. It’s as if, even though Sam has long gone, his magical presence continues to be felt as he left his mark in ways that are still being unveiled. To quote another line from Ann Marie, ‘the show still goes on’. Special thanks to Ann Marie Fleming for sharing her story, research material and for the idea behind the title. Much of the story told here, including many of the quotes can be found in her animated documentary and graphic novel – The Magical Life of Long Tack Sam. NOTE: This piece was originally published on the Australian National Maritime Museum blog on 27 May 2014. Reproduced courtesy of the Australian National Maritime Museum.